To cancel, send STOP to 94033 at any time. For help, send HELP to 94033at any time. YOUTH GROUP: Sunday nights (5 – 7 PM). On Sunday nights we focus on all three of our Youth Group goals (love God. love people. have fun.) There are a variety of activities, trips and discussions that go on during Youth Group. We might be playing Laser Tag, Ultimate Frisbee, or our annual Super Bowl Party, or we may be playing BINGO at a local nursing home or throwing a Christmas Party for some of the local children, or we may be discussing important issues that matter to you and asking what God thinks about those issues. Every Sunday Night is an adventure. We even have a free snack supper from 5 – 5:30 PM. Bring a friend! What is your HIGH POINT for the week? Where did you SEE GOD this week? YOUTH SUNDAY SCHOOL: Sunday mornings (10 – 10:45 AM) This is the time where we really get into the depth of our relationship with God. We discuss topics about God’s desires for our lives and how we can live those desires out! Each Spring, the High Schoolers head up to YMCA Blue Ridge Assembly for a retreat in beautiful Black, Mountain, NC. We discuss a variety of topics that help you grow in your relationship with God. We also participate in a High Ropes Initiatives and a Saturday Night campfire. Information about this retreat will be available on this website in early Spring! The Middle Schoolers get to go on a Spring Retreat also! We will go to Camp Hanes for the Western North Carolina Annual Conference event called “Kaleidoscope”. Middle Schoolers from all over western North Carolina come together for meaningful worship, fun games and meeting new people. Information about this retreat will be available on this website in early Spring! 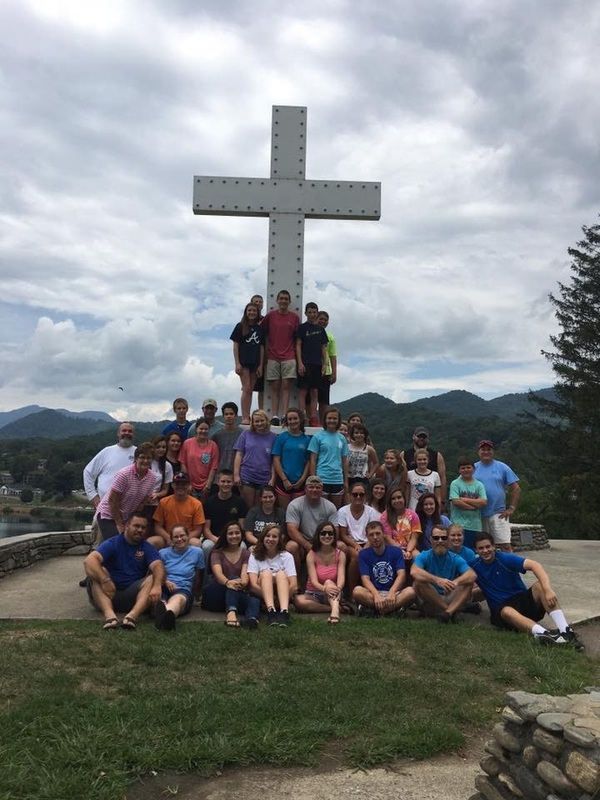 In late summer, we take another retreat to Lake Junaluska, right outside of Waynesville, NC. Our Youth group has been staying at Providence Lodge for nearly 40 years for our annual Youth Retreat where we send off our graduates and spend some quality time at the Lake J cross! We have also been known to go tubing in Asheville or visit the Pisgah National Forest at go to Sliding Rock! Information about this retreat will be available on this website in mid-Summer! Each year in early June the clergy of Memorial UMC get the Sunday off and the youth of Memorial get to take over the worship service! We take care of every aspect of the worship service, from special music, to the prayers and even the sermon! It is a great honor for us to show the rest of the congregation just how God is moving in our lives! Every year since 1997 Memorial United Methodist Youth have proudly participated in a ministry called Appalachia Service Project (ASP). This is our summer mission project in which the goal is to address sub-standard housing in Central Appalachia by making homes warmer, safer, & drier. For more information on our church’s ASP opportunities please check us out HERE. In the fall, we go to some of our shut-in’s homes and rake their leaves for them. It is a small gesture that we can do to help out some of our fellow church members who have given so much to our church. Plus, its just lots of fun jumping in a giant pile of leaves! Every year we throw a Christmas Party at our church for some of the “under-served” children in our community. We have crafts, games, a Christmas Story drama and Santa even comes. As a youth, you will “adopt” one of the kids for the day and help them find their way around our church and basically make sure they have a good time. There are other ways that we reach out into our community as well (including BINGO at the nursing home, cooking meals for sick and elderly folks), but you will just have and check out some the meaningful ways we make a difference! In the winter we make our way to West Virginia and go skiing at WinterPlace Ski Resort! We spend the weekend skiing and fellowshipping with our friends and we spend the night right on the WinterPlace complex in the “Mountain House”. Information about this trip will come out in early January. As summer draws to a close and school is ready to begin, we take time to let our new 6th graders know it’s time to start attending Youth Group. We invade FOUNDER’S POOL and throw a party to say goodbye to summer and hello to the new school year!!! We are blessed to have generous church members who let us go to their lake houses (at High Rock Lake) and borrow their boats! This is a great summertime activity that everyone looks forward to! Since it is now illegal to use the words that describe that FOOTBALL GAME in February, we have a “BIG GAME PARTY” and watch some great commercials!!! We get together on S**** Bowl Sunday to have some fun and cheer on our favorite team!